In today's recruit spotlight, we caught up with Michael Sproles as he talked about his versatility, taking over the quarterback position for the rest of the season, his goals for the season, and so much more! LAFM TV 12th Season! Episode 5! October 10, 2017	Comments Off on LAFM TV 12th Season! Episode 5! LAFM TV 12th Season! Episode 4! October 3, 2017	Comments Off on LAFM TV 12th Season! Episode 4! Check out this week's show! Click the link for more information! 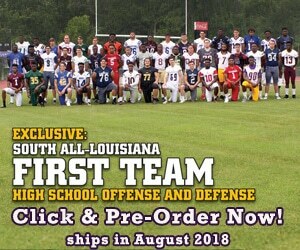 In today's recruit spotlight, we caught up with Garrett Roberts before the West Feliciana game as he talked about his improvement from last year to this year, playing for Coach Schooler, the offers that he has received so far, and so much more! LAFM TV 12th Season! Episode 3! September 25, 2017	Comments Off on LAFM TV 12th Season! Episode 3! In today's recruit spotlight, we caught up with Blake Anderson as he talked about his fantastic high school career, his message for colleges, his thoughts on Friday's upcoming matchup against Live Oak, and so much more!